I will cover some other important topics relevant for UPSC Civil Services Mains Examination with relevant sources of information to save time and effort of candidates appearing in this years examination. Like many other Web sites, www.upsc-prelims.blogspot.in makes use of log files. The information inside the log files includes internet protocol ( IP ) addresses, type of browser, Internet Service Provider ( ISP ), date/time stamp, referring/exit pages, and number of clicks to analyze trends, administer the site, track user’s movement around the site, and gather demographic information. IP addresses, and other such information are not linked to any information that is personally identifiable.
.:: Google's use of the DART cookie enables it to serve ads to users based on their visit to www.upsc-prelims.blogspot.in and other sites on the Internet. www.upsc-prelims.blogspot.in has no access to or control over these cookies that are used by third-party advertisers. A very common query of civil services examination aspirants is which magazine should be read for comprehensive preparation. The answer to this question is not easy as every individual is unique and what may work for one individual may not work for another. Also, since there is a wide range of choice available in terms of magazines aimed at civil services aspirants, it becomes a case of following the herd. I used to read CSR while in school and college, especially the interviews of IAS toppers and it used to be quite inspiring. While giving this exam, I subscribed to Competition Wizard and I found its special supplements quite useful from exam point of view. But still during all the preparation years I always felt the need of a magazine that could capture the most relevant editorials of The Hindu and news items from examination point of view. Also while reading a news item or editorial, sometimes one felt the need for background information on the subject, for example an editorial on Israel-Palestine Peace Process might not be understood in its full sense by a newcomer unless he or she is aware of the genesis of the conflict. Also, many a times one used to read the editorials and keep newspaper cuttings as well but they just gathered dust and could not be made use of in exam situation. To overcome all these handicaps in preparation of UPSC Civil Services Examination few like-minded friends with hands-on experience of mentoring IAS aspirants have joined hands to bring out a student friendly magazine that captures all the important news items and happenings across the world with background information wherever needed and present it in a form that is easier to read, retain and reproduce in exam for getting maximum results under the name of Civil Services Synopsis. 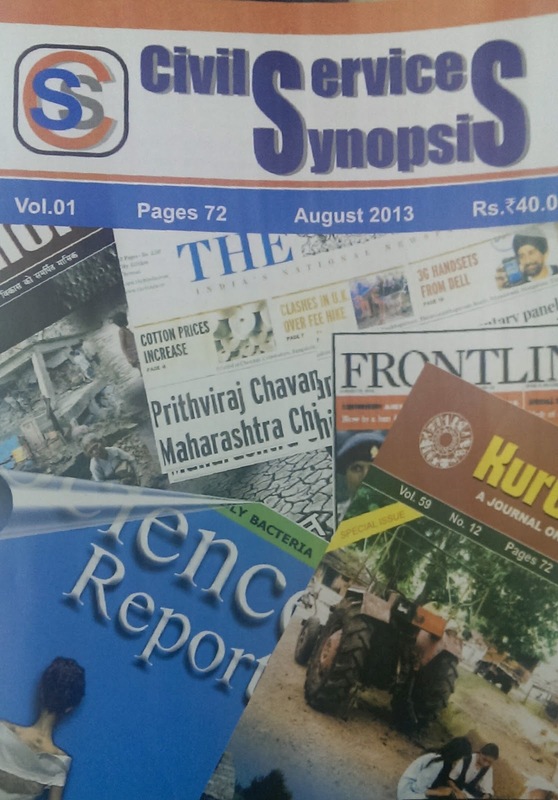 The first issue of this monthly magazine Civil Services Synopsis is now in stands and should be a good source of brushing up national and international current affairs for UPSC Civil services Examination. The entire UPSC preparation boils down to effective time management and this magazine should enable aspirants to use their time judiciously and get the maximum returns. For readers who would like to subscribe to the online version of this magazine please drop an email at 'cs.synopsis@gmail.com' and also share your feedback so that it can be made better with every subsequent issue. The UPSC Civil Services Mains Examination has an important paper on Essay writing for 250 marks from 2013 Main Exam onwards, earlier the paper was of 200 marks. The essay paper has a choice of at least 5-6 topics covering all the broad areas that a UPSC aspirant is expected to know. While the above mentioned guidelines given by UPSC may seem very innocuous, but understanding it and adhering to these guiding principles can easily fetch one a good score of 150+ in essay paper. Choice of Topic - First and foremost thing while writing an essay is to select the topic you are most comfortable with as otherwise you will invariably run out of ideas while writing your essay. The topic about which you know the most would be your best bet for getting a decent score. Brainstorming - Once you have zeroed down on the topic, the next and most crucial step is to ideate, i.e., to brainstorm for at least a good 30-45 minutes and jot down all the ideas that come to your mind about the topic in question. Orderly Arrangement of Ideas - Once one has jotted down all the points, one should arrange them in coherent, logical sequence. One should then think of an introduction and conclusion of the essay from the points jotted down. Length of Essay - The length of the essay should be around 1000-1200 words and any essay much shorter or much longer would be a waste of time and effort. The heading of the essay should be written in a neat fashion and underlined. Also important statements within the body of the essay should also be underlined for the desired impact but underlining should not be overdone. Sticking to the Essay Topic - One idea or point should ideally be covered in one paragraph and paragraphs should follow in a logical manner without much abruptness. A common pitfall while writing essay for UPSC Civil Services Mains Examination is that candidates tend to get carried away from the topic of the essay and this is counterproductive and goes against the UPSC guideline of keeping closely to the subject of the essay. Not keeping this important tenet in mind would lead you to digress from the topic of the essay and lessen your chances of getting a decent score. Quoting Facts and Figures – One can and should quote statistics in the essay if it helps in emphasising one's point of view but there is no harm in not quoting any figures if one is not sure or does not remember any particular statistic. Avoid bluffing and making up any kind of statistic in the essay paper as it will be a big negative and can lead to very poor scores. Effective and Exact Expression - While UPSC does not expect candidates to write an essay using flowery language but it does expect the candidates to write essay using simple but grammatically correct sentences. A good vocabulary helps the candidate to use the right expression and convey the exact meaning without writing too much. For this, a candidate should focus on improving one's vocabulary and rely on constructing simple sentences rather than using a difficult word out of context just for the sake of using it. Practice is the Key - For getting a good score in essay paper, one should practice writing down points for at least 8-10 probable essay topics and 2-4 full length essays and get them evaluated from a subject expert. Few topics that can be prepared for essay writing are – Democracy and its Challenges, Women Empowerment and Violence Against Women, Climate Change and Disaster Management, Curbing Corruption in Public Life, Growing Role of Social Media in Forming public Opinion etc.